February 1, 2019 – The month of January has been marked by high impact weather in many parts of the world, including dangerous and extreme cold in North America, record heat and wildfires in Australia, high temperatures and rainfall in parts of South America, and heavy snowfall in the Alps and Himalayas. Large parts of North America have been gripped by an influx of Arctic air. Combined with gusty winds, this is producing dangerous wind chills across a significant portion of the Upper Midwest into the Northeast USA. The frigid airmass is also supporting heavy lake effect snows downwind of the Great Lakes. The US National Weather Service said that temperatures will be well below average over the Upper. Mississippi Valley, Great Lakes, into parts of the Northern Mid-Atlantic. In southern Minnesota, the wind chill factor pushed readings down to minus 65°F (-53.9°C) on 30 January. 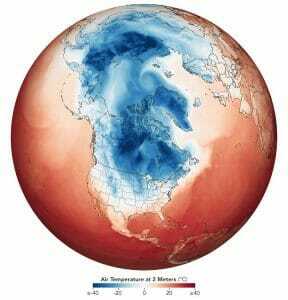 The national low temperature record was measured at minus 56 °F (-48.9°C). The bitterly cold temperatures are caused by the influence of the Polar Vortex. This is a large area of low pressure and cold air surrounding the North Pole, with strong counter-clockwise winds known as the jet stream that trap the cold around the Pole. Disturbances in the jet stream and the intrusion of warmer mid-latitude air masses can alter the structure and the dynamics of the Polar Vortex, sending Arctic air south into middle latitudes and bringing warmer air into the Arctic. This is not a new phenomenon, although there is increasing research into how it is being impacted by climate change. 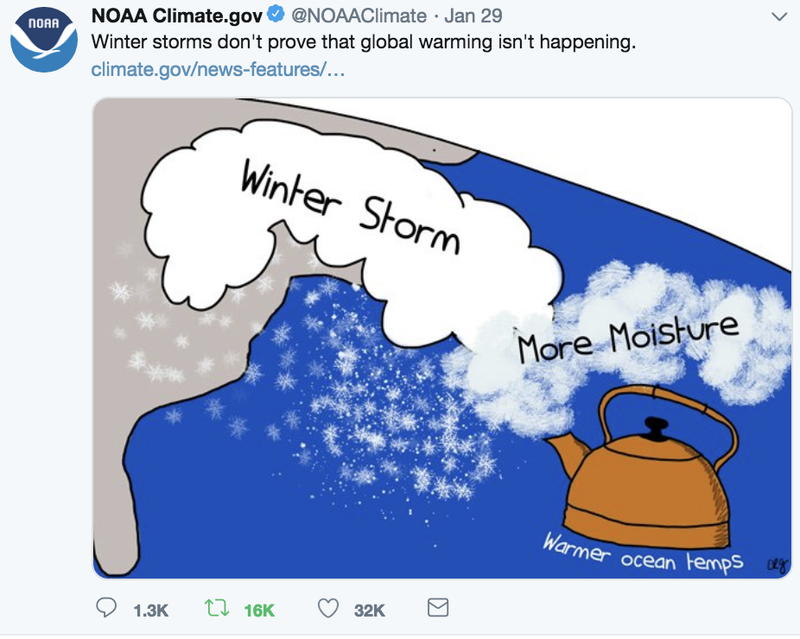 “The cold weather in the eastern United States certainly does not disprove climate change.,” said WMO Secretary-General Petteri Taalas. “Arctic has faced a warming, which is twice the global average. A large fraction of the snow and ice in the region has melted. Those changes are affecting weather patterns outside the Arctic in the Northern Hemisphere. A part of the cold anomalies at lower latitudes could be linked to the dramatic changes in the Arctic. What happens at the poles does not stay at the poles but influences weather and climate conditions in lower latitudes where hundreds of millions of people live,” he said. The eastern USA and parts of Canada are seeing record-breaking cold temperatures, but Alaska and large parts of the Arctic have been warmer than average. In Canada, Ottawa airport received a record 97 cm of snow on 29 January, beating the 1999 record of 93 cm, according to Environment and Climate Change Canada. Winter snowstorms and heavy snowfall are also not inconsistent with weather patterns under a changing climate. Parts of the European Alps saw record snowfalls earlier in January. In Hochfilzen in the Tirol region of Austria, more than 451 centimetres (cm) of snow fell in the first 15 days of January, an event statistically only expected once a century. Other resorts in Tirol also received once-in-a-century snowfalls. Eastern Switzerland received twice as much snow as the long-term average. A cold front in the third week of January that swept south through the Arabian Peninsula, bringing a widespread dust storm from Egypt to Saudi Arabia, Bahrain, Qatar, Iran and the United Arab Emirates, brought heavy rain and precipitation to Pakistan and northwest India. The Indian Meteorological Department issued warnings on 21 January of heavy or very heavy rain and snow for Jammu and Kashmir and Himachal Pradesh, prompting warnings of avalanches amid an intense cold wave. Australia had its warmest January on record, according to its Bureau of Meteorology. The month saw a new series of heatwaves unprecedented in their scale and duration. Overall rainfall was 38% below average for January. 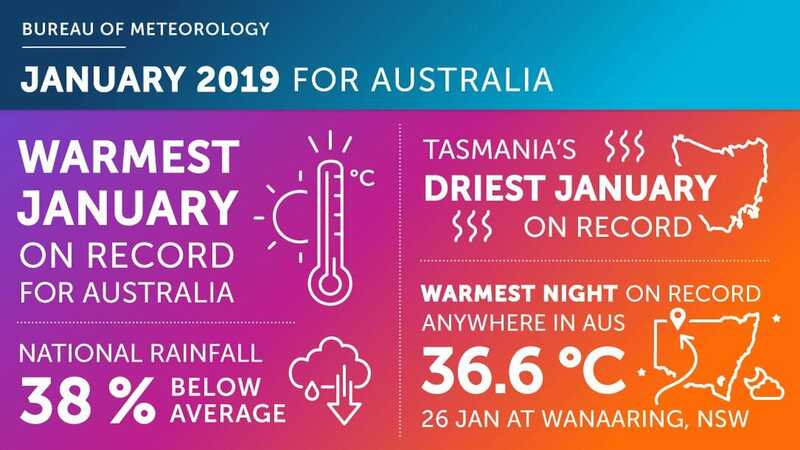 Tasmania had its driest January on record. 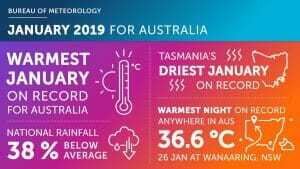 Australia saw an unusual extended period of heatwaves which began in early December 2018 and continued into January 2019. The city of Adelaide reached a new record 46.6C on 24 January. Other records in South Australia included Whyalla 48.5, Caduna 48.6°C, Port Augusta 49.1°C, according to the Bureau of Meteorology. Large fires fuelled by extremely dry and hot conditions have been burning since mid-January in central and southeast Tasmania, the southernmost state of Australia. As of January 28, the Tasmania Fire Service reported 44 fires. The Great Pine Tier fire in the Central Plateau had burned more than 40,000 hectares. The Riveaux Road fire in the south had burned more around 14,000 hectares. News outlets reported smoke from some of the fires was visible as far away as New Zealand, and had a serious impact on air quality. The Tasmania Fire Service issued several emergency warnings to residents to relocate, as dangerous fire conditions and strong wind persist. Many of the fires are in the world heritage area, hitting rare gondwana ecosystems only found in Tasmania which historically do not burn. Over the past several weeks, the sea surface temperatures (SSTs) have warmed in the Tasman Sea with anomalies of +2.0˚C to 4.0˚C. Compared to the exceptional conditions at this time last year, SSTs are even warmer to the north and east of New Zealand and about equally as warm in the Tasman Sea, according to the New Zealand Institute of Water and Atmospheric Research. Given that SSTs have been significantly warmer than average for several weeks, marine heatwave conditions are likely now occurring in parts of the Tasman Sea and New Zealand coastal waters, it said. Australia had its hottest month of December on record and its hottest December day (27 December) on record. Marble Bar, in Western Australia, recorded a temperature of 49.3 °C on 27 December. Elsewhere in the southern hemisphere, heat records tumbled in Chile. A weather station in the capital Santiago set a new record of 38.3°C on 26 January. In other parts of central Chile, temperatures topped 40°C, according to Meteo Chile. Argentina has also been gripped by a heatwave, prompting a number of alerts about high temperatures.. Northeast Argentina, and the adjacent parts of Paraguay, Uruguay and Brazil have been hit with extensive flooding, with well above the long-term expected average rainfall. On January 8, the Argentine city of Resistencia recorded 224mm rainfall. This is a new 24-hour rainfall record, much higher than the previous highest of 206mm, recorded in January 1994, according to the national meteorological service, SMN Argentina. Tropical cyclone Desmond made landfall in Mozambique on 22 January, bringing high winds and causing flooding in the city of Beira and enhancing rainfall in Madagascar and Malawi.